For Glasgow based graphic novelists Metaphrog, who are artist Sandra Marrs and writer John Chalmers, 2009 has been a busy year. As part of National Poetry Day in October they adapted the poem The First Men on Mercury by Edwin Morgan into a four page, full colour comic of which over 32,000 copies were given out free to Glasgow's school children while they also have continued work on the fifth of their Louis graphic novels, Louis Night Salad. In addition to this writing and illustrating they have also regularly given workshops on their work and on comics creation in general and this year to date they have presented some 26 workshops to the general public as well as both primary and secondary school pupils. On 16 January they were at Oldmachar and Harlaw Academies in Aberdeen for two separate workshops for secondary school children and they were back to Aberdeen on 30 January at Bridge of Don Academy. 6 March saw them take part in the Big Book Bonanza at Perth High School while their first public workshop of the year was for teens at Johnstone Library on 26 March. 8 March saw them do their only non-Scottish events with two workshops at Cardiff Central Library before returning to Scotland and another two workshops on 15 May at Alexandria and Duntocher libraries as part of the West Dunbartonshire Festival of Words. On 19 June they were at Glasgow's Hillpark Secondary School Book Week before a run of six public workshops for 8-14 year olds from 7-9 July in Dalmuir, Parkhall, Balloch, Dumbarton, Clydebank and Alexandria libraries. 26 August brought perhaps their most significant event of the year when they sold out the Edinburgh International Book Festival's RBS Workshop Tent with a teen workshop entitled Design Your Own Comic. 21 September took them to Bellshill's Cultural Centre Library for two workshops for late primary pupils while 30 September to 2 October saw them give five workshops to teens as part of the school orientated WESTWord Festival section of the Wigtown Book Festival at Stranraer Academy, Newton Stewart's Douglas Ewart High School and the main Wigtown Festival marquee. On 23 October they were near Edinburgh at Kirkliston library for a children's workshop while on 6 November they finished off their 2009 workshops with one at Edinburgh's St-Thomas of Aquin's High School. October's Kirkliston workshop has just been featured in the City Of Edinburgh council's Edinburgh Outlook newspaper with a picture of Sandra looking over the illustrations that the Kirkliston children produced. The article is also available on the Edinburgh Outlook website. For libraries, schools or other organisations wishing to discuss putting on comics workshops with them, Metaphrog's details are available on the Scottish Book Trust website along with other Scotland based comics creators such as Alan Grant, David Bishop and Denise Mina. Metaphrog can also be contacted directly through their own website. The full version of The First Men on Mercury comic is available here. More details of Metaphrog and the Louis series of graphic novels are available on the Metaphrog website. Titan Publishing are reporting a huge success for their Wallace & Gromit digital comic, which launched last month (see news story). The strip is taking the iPhone app charts by storm and is currently ranked number one in the UK free books app store, a first for a British comic! The comic has also risen to the number three spot overall in the free apps chart and all four paid for Wallace & Gromit comic apps are currently within the top 20 paid apps in the UK book chart. With over 170,000 downloads of the Wallace & Gromit free app around the world, it’s not only the British who apparently can’t get enough of Aardman Animation’s iconic duo – it’s also currently the number one free book download in Australia, New Zealand and Finland. "We've been amazed at how well our first app has done," commented Wallace & Gromit digital comics editor Ned Hartley. "Wallace & Gromit is such a great brand, and iPhone users obviously love them as much as we do!" • You can download the first Wallace & Gromit Comic, ‘The W Files’ for free at www.wallaceandgromitcomics.com, and there are four other fantastic Wallace & Gromit comics available at the app store, for just 59p each. Publisher Mohawk Media has announced that it is in search of artists for upcoming comic book and graphic novel projects. To help spearhead this search, Mr. T author, British comic creator Christopher Bunting, has been appointed as Editor-In-Chief. "As a freelance writer, one in the early stages of his career, I know just how tough it is to break into comic books," he explains. "I’ve often heard aspiring artists say there are no openings. I’m therefore proud to be part of this Mohawk Media initiative to give artists the opportunity to become published, paid, and involved in some of the coolest titles of 2010!" "Remember, comics are a storytelling medium,"Bunting continues. "Those are the skills that you need to demonstrate." "We’re excited to see what comes in. Good luck!" 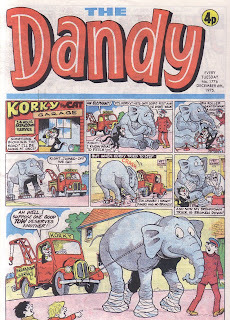 Not so much news as "olds" but it is worth mentioning that the Belfast Telegraph gave away modern reprints of old Beano and Dandy comics during the week beginning 23 November 2009. The six issues were reprints of the Beanos and Dandys cover dated 22 & 29 November and 6 December 1975. Like the comics reprints that were published in the Guardian in September this year, these Beanos and Dandys were direct reprints with nothing added such as a 'Given free with the Belfast Telegraph' flash. Unlike the Guardian, which reprinted comics from both the DC Thomson and IPC archive, the paper only dealt with DC Thomson titles. The Belfast Telegraph is Northern Ireland's biggest selling local newspaper and is part of the Independent News and Media (INM) group which publishes the Independent newspaper in the UK and the Irish Independent in the Republic of Ireland. It is interesting to speculate that in the year that 247 people died in the Troubles in Northern Ireland and in London one of the presenters of the children's TV show Record Breakers was assassinated by the IRA's Balcombe Street gang, at least some of the Provence's children, denied the freedom to play in the streets and parks due to concerns for their safety, may have found a different outlet for their self expression. The interview with Morris Heggie is on the Belfast Telegraph website. Lucky Luke is the cowboy who can shoot faster than his own shadow and, in the French speaking world, is probably third in bande dessinees character popularity behind the behemoths of Tintin and Asterix with over 70 titles published - easily more than the other two put together. He was created for Spirou comic by Maurice De Bevere (Morris) in 1946 who wrote and drew it until 1955 when René Goscinny, in his pre-Asterix days, joined him as writer. 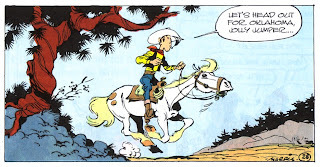 Lucky Luke subsequently moved from Spirou into Goscinny's Pilote comic in 1967 and Morris and Goscinny continued their collaboration until Goscinny's death in 1977 when other artists and writers began to work on the title. Surprisingly Lucky Luke has had quite some history in British publications, appearing first in the weekly comic Film Fun before being renamed as Buck Bingo in Giggle in 1967 before Giggle merged with Buster. English language books have been published by Hodder and Stoughton / Brockhampton in hardback in the early 1970s with the equivalent Knight softcovers in the mid 1970s. Hodder tried again in the early 1980s, while Ravette tried in the early 1990s and then finally Glo'worm in the late 1990s. However none of them have had quite the impact of the Cinebook publications which now number 20 different Lucky Luke titles - more than the rest of the UK publishers put together. 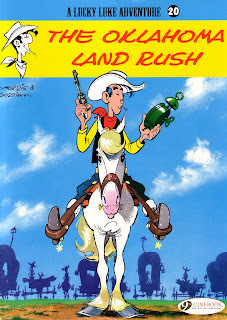 According to Cinebook's newsletters, Lucky Luke is consistently their biggest seller with a new title released every other month and the latest is The Oklahoma Land Rush. Cowboy Lucky Luke, on his horse Jolly Jumper, has been hired by the United States government to clear the territory of Oklahoma prior to the land rush for the territory in which settlers will stack a claim to the land and which is due to take place on 22 April 1889. Having ensured that the territory is clear of claim jumpers, he then follows the settlers as they stake their claims and build the town of Boomville which he effectively becomes sheriff of as he settles the squabbles and thieving of certain disreputable townsfolk. 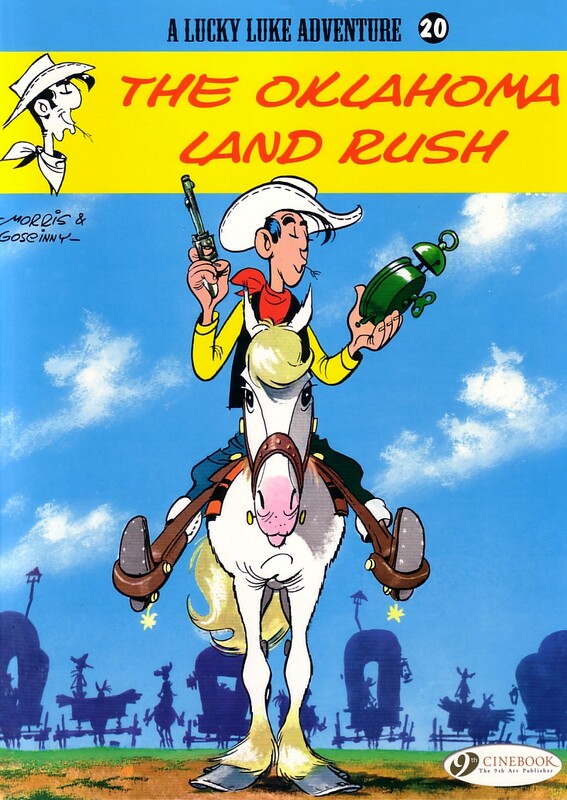 This Morris and Goscinny book may be Cinebook's 20th Lucky Luke but it was originally published as the 14th album by Dupuis in 1960 as Ruée Sur l'Oklahoma with the story dating back to 1958 in Spirou. Goscinny's humourous story races along as Luke deals with each problem in turn as part of the overall story. Indeed the book perhaps shows its weekly comic origins in the multitude of stories within the main story covering as it does a much long period of time than you would expect of a typical humour story. Yet this is not a drawback as our hero often comes across the same characters that he had to deal with earlier in the story while Morris' art is fun and accessible despite having few backgrounds to play with during the land rush itself due to the desolate nature of the Oklahoman landscape. Based on this book, it is easy to see why Lucky Luke is so popular. This is a quick, easy, fun read for adults which is eminently suitable for young readers and with Christmas coming up it could well be worth considering as a present for younger sons and nephews since, if they like this one, there are plenty more titles for them to collect. • More details of the Lucky Luke books are on Cinebook's website. • More details on Lucky Luke are on the official Lucky Luke website (in French). 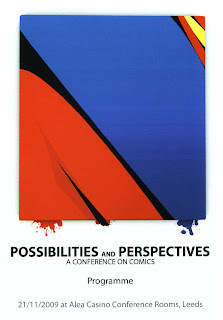 In the aftermath of Thought Bubble and its associated academic conference on comics, Possibilities and Perspectives, here is round up of what is happening comics-wise in the hallowed halls of academia. We have recently mentioned on downthetubes the Fractured Images, Broken Words postgraduate conference at Lancaster University on 12 June 2010 which will include former 2000AD editor Andy Diggle as one of the key-note speakers. 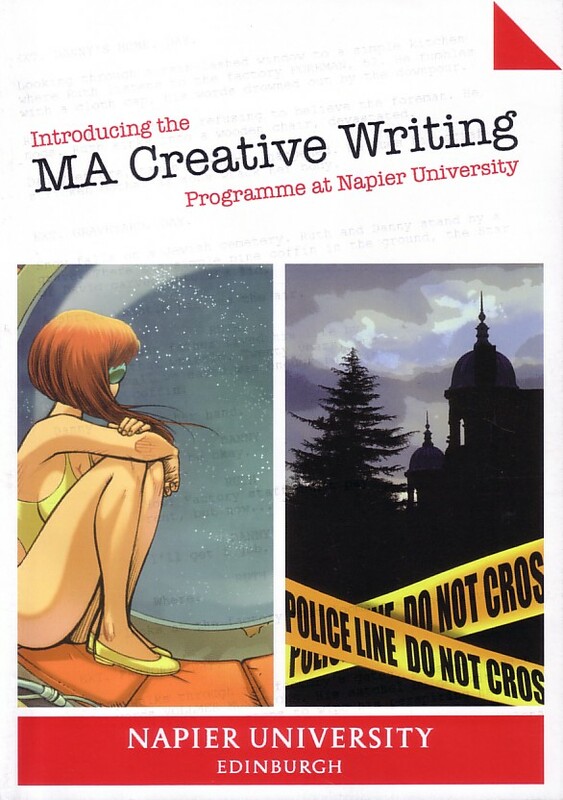 Before that on 13-14 April 2010 Manchester Metropolitan University will host an academic conference entitled The Graphic Novel and Comic Conference: Comics, Cultures & Genres, hosted by Dr David Huxley and Dr Joan Ormrod who have previously organised the university's 2007 Aesthetics of Trash conference on animation and comics. 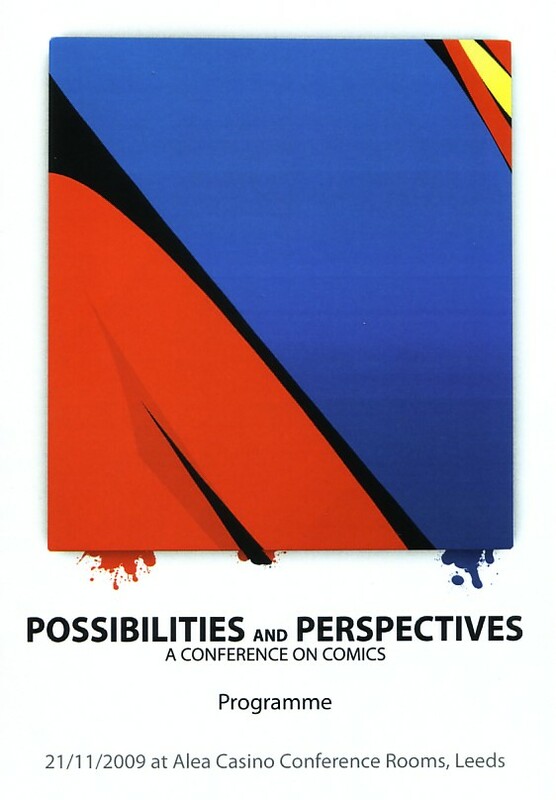 This conference will tie-in with the launch of a new academic comics publication, the Journal Of Graphic Novels And Comics, from the university's Faculty Of Art And Design. The longest running of the various academic journals is the American based International Journal Of Comic Art which has been running since 1999, although their website is not that up-to-date. 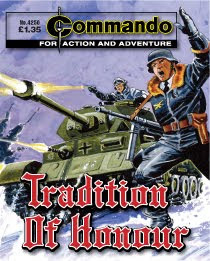 We mention it here as the current issue has a long interview with Scottish comics artist Ian Kennedy on his work which includes Dan Dare, Judge Dredd and of course Commando. Closer to home is European Comic Art from Liverpool University Press which is the first English language scholarly publication to study European language graphic novels and comics. This has been going since 2008 and is published in association with the Glasgow based International Bande Dessinee Society and the American Bande Dessinee Society. Due to begin publication in 2010 is Studies In Comics from Intellect Books, one of the editors of which is Dr Chris Murray of Dundee University who has been instrumental in organising the Dundee University Comics Day for the last three years as well as the Beano 70th Anniversary exhibition and event. Plans for the fourth Comics Day in Dundee to be held in the middle of 2010 are at an advanced stage. 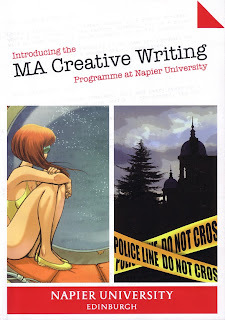 Perhaps the best known academic tie-in with comics is Edinburgh's Napier University with its MA in Creative Writing course taken by Sam Kelly and former 2000AD editor David Bishop. This is in its first year and is scheduled to include guest speakers such as Alan Grant, Mark Millar and Leah Moore. More details of academic publications and conferences will appear as we receive them. Has it really been five years since Bill Rudling started publishing Cosmos? Titan's series of Jeff Hawke books may have stopped after two titles but Bill's 84 page, A4 sized zine which reprints complete stories from the Daily Express' daily Jeff Hawke strip created, illustrated and often written by Sydney Jordan, is now coming to the end of its fifth year with a sixth year planned. Volume 5 Number 3 includes the complete Jeff Hawke stories Faery Land Forlorn from 1964, The Engine That Worked On Grass from 1967 (as illustrated on the front cover) and Rogue Star from 1968/69. 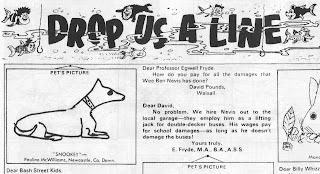 In addition there are detailed articles on each story by Duncan Lunan as well as articles on Rick Random and the little remembered Time And Ms Jones strip from the Sunday Times written by Marise Morland and illustrated, in part, by Sydney Jordan. 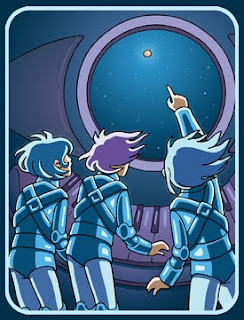 A subscription Jeff Hawke's Cosmos for three issues costs £20 in the UK, £30 overseas. Cheques made payable to Jeff Hawke Club with a stamped addressed envelope should be sent to: The Jeff Hawke Club, 6 The Close, Alwoodley, Leeds, LS17 7RD, United Kingdom. There are more details on the Jeff Hawke Club website. Underground And Over The Top is the latest in Titan's annual Charley's War reprint series and it follows the story of First World War soldier Charley Bourne from May to September 1917. The book covers two full stories with the beginning of a third. 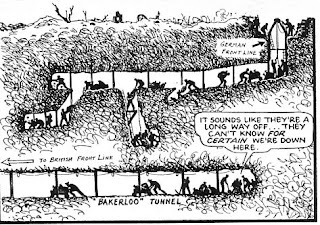 Charley has been posted to tunnelling duty as the British dig mine shafts towards the German guns at the Messines Ridge and the story takes place mainly underground as the troops get closer to their objective - setting massive amounts of explosive under the German positions. After Messines the book returns to the trenches with the Third Battle Of Ypres, now better known as Passchendaele, as heavy rains turn the front line into a quagmire that is as dangerous to the troops as the enemy are. The book finishes with Charley's unit being pulled back from the front line to the huge training camp at Etaples, a camp where the regime is so brutal that the men are on the verge of mutiny, and a meeting with an old friend. For the sake of transparency this is where I will point out that the editor of Titan's Charley's War series is now our own Chief Tuber, John Freeman. That said the format of the series of books was set five years ago with the first book and, since they are both a critical and commercial success, there is no reason for any new editor to change the format and John doesn't. From the classy black and white photo cover with its red poppy, through the scene setting feature on the Messines tunnels to the "DVD commentary"-like notes of writer Pat Mills at the end, the format still works and continues to work well. 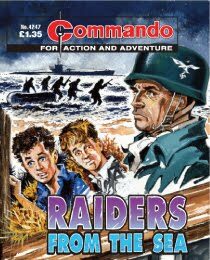 How many other hardback comic reprint book series that Titan have started have faltered after the first or second publication? Yet here is Charley's War still going strong on its sixth book. Of course a lot of that is down to the strip itself. Widely considered to be one of the best British comic strips ever published, Pat Mills heavily researched scripts combine with Joe Colquhoun's intensely detailed artwork to create something that perhaps becomes more that the sum of its parts. The Messines tunnelling section has every opportunity to be dull, after all Charley's War readers signed up for combat not digging. However Mills includes a conscientious objector within the unit which leads to much discussion between the characters of the ethics of killing while Colquhoun goes as far as producing a cutaway panel to show just how close the British and German tunnellers were getting. The Passchendaele story returns to the more familiar territory of the trenches and hand to hand fighting this time in heavy rain which falls for four consecutive week's episodes. The final story sets the scene for the Etaples mutiny with hard, pointless training and a band of deserters raiding the camp. 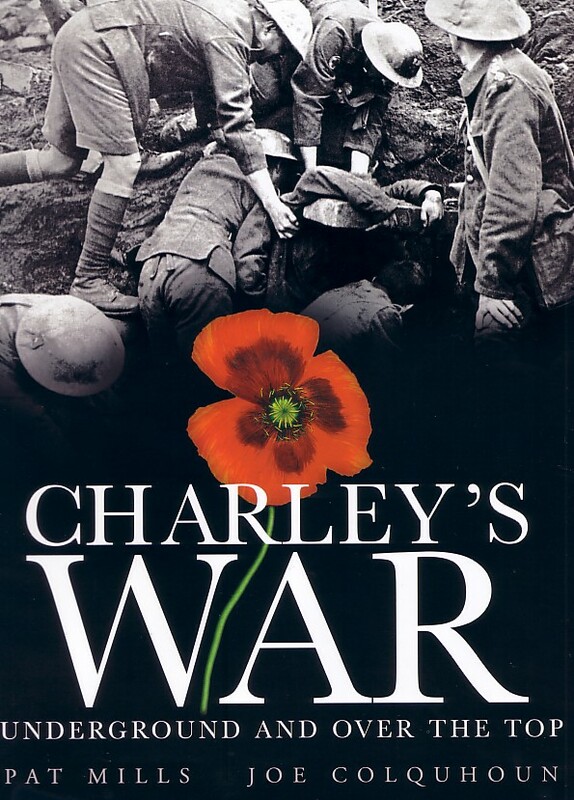 The biggest issue with the reprints of Charley's War from this period of its publication in Battle is the fact that it often was printed on the cover or in the centre spread and those particular pages were therefore in colour. As this book is in black and white and reprinting from the weekly comics rather than the long lost original artwork, the formerly coloured pages are soft in their reproduction with their text picked out in a darker black. The original black and white pages are reproduced better than the last Charley's War book in which the hard blacks lost much of the subtlety of Colquhoun's art and while the blacks in this edition are not always solid, the reproduction of the B&W pages represent the original publication in Battle better. Classy story telling and classy art combined with thoughtful text articles mean that Charley's War - Underground And Over The Top remains as impressive as its forebears and the only real complaint is, as ever, that we will have to wait a year before the next one appears. Tommy Bell was heartbroken when he was evacuated from his blitzed home city of Glasgow. To him the countryside was dull - nothing ever happened. But Adolf Hitler gave an order that was to turn Tommy’s new home into a battle-torn hot spot. Crack German troops mounted a raid to capture a British secret weapon and all that stood between them and success were a few regular soldiers, the local Home Guard - and Tommy Bell! They were the crew of one of the last Catalinas out of Singapore as it fell to the Japs - and the target of every enemy fighter around. It made sense to get out of the area fast, so what were they doing down on the sea, slowly towing two lifeboats full of exhausted infantry? Sergeant Roy Willis had fought bravely throughout the First World War. By November 1918 the end was in sight, the armistice due come into force in a matter of hours. And though Roy was determined to make sure that the lads in his squad would get back home safely, a villainous fellow sergeant had other ideas. 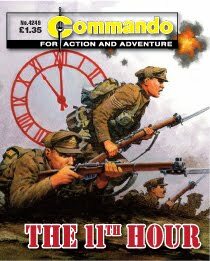 Would Roy survive to hear the clock strike… THE 11TH HOUR? The Zonder and Von Trager familes had fought alongside each other in battles throughout the ages. They had never revelled in the grim realities of war but they had always acquitted themselves with honour. 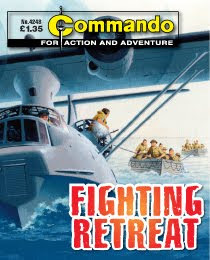 Now, in the Second World War, the latest generations were going into battle. But Karl Von Trager had fallen under the Nazi spell. Influenced by their ruthless tactics how could he possibly uphold the TRADITION OF HONOUR.